High pressure ridge continues along the coast and will hold there through Thursday and the slowly weaken. Northern California will be mostly clear. Tonight through Wednesday there will be cold temperatures in the wind sheltered valleys. Gusty north winds will occur in some areas through Tuesday. In the Saturday blog I thought we would have a weak system Friday and then stronger one on the weekend. The models now show the Friday system going inland to our north and the weekend system splitting apart with the southern end moving into Southern California. The models do differ on this with the GFS (see map below) moving the system into Southern California, while the European splits the system but brings the southern portion more into Northern and Central California. Expect we will see some clouds this weekend with showers. Both models show a stronger storm system early next week. High pressure is off the coast and will hold there through Thursday. During this time Northern California will continue mostly clear with a few clouds in the north from systems moving into the Pacific Northwest. Temperatures will be near normal with gusty north winds Sunday afternoon through midday Wednesday. 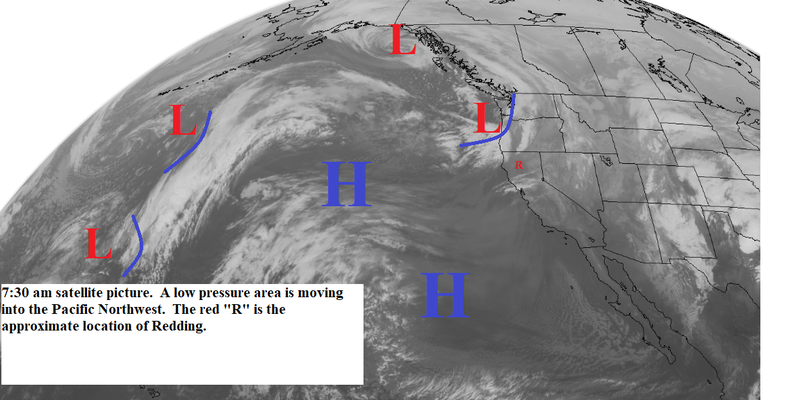 Thursday the high will begin to weaken and a low pressure trough will be just off the coast by Friday (see map below). A weak frontal system will bring a light rain or showers late Friday with a stronger frontal system expected on the weekend. Snow levels with these systems will be 3500 to 4500 feet. A low pressure area and frontal system is moving into the Pacific Northwest, while off the coast high pressure is beginning to build or push northward. The Pac NW system will bring some clouds and isolated light showers, later today and Thursday, to the areas near the Oregon border and along and east of the Sierra Cascade Crest. 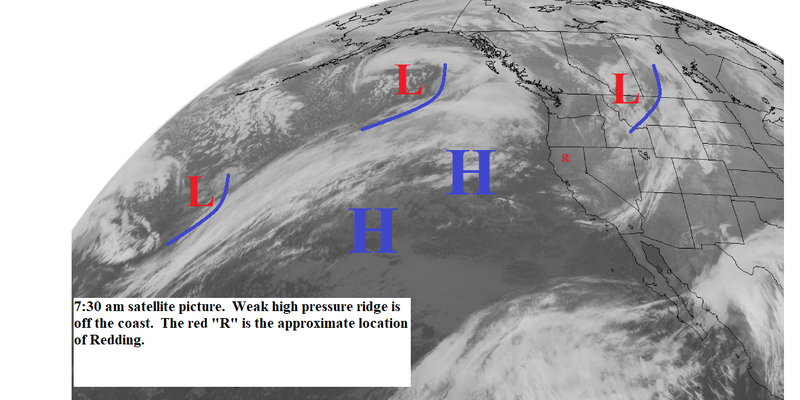 The high pressure ridge will be off the coast through the end of the year (see map below). The north state will be mostly sunny with a few clouds from storms moving by to our north. There will periods of gusty north winds. Winds sheltered valleys will see cold temperatures tonight through Friday night. It looks like the high pressure ridge will break down around the 4th of Jan.
A low pressure area is off the coast and will move across Northern California today. Rain will spread over the entire area with showers tonight and early Tuesday. Snow levels will be 3500 to 4500 feet. Tuesday through next weekend a high pressure ridge will be off the coast with a low pressure area to our east (see map below). During this time we will have mostly clear skies. The exception will be Wednesday and early Thursday when a storm system will move through Oregon and drop into the Great Basin. We see some clouds from this system with showers over the areas north and east of Redding. Periods of gusty north winds will occur Tuesday through the weekend. Clouds will slowly increase today as a weak frontal system approaches the coast. This system will spread light rain or showers over the area tonight. Most of the precipitation will be over the foothills and mountains. Snow levels will be 4000 to 5000 feet. A strong low pressure area will move into the north state Monday with rain expected for the entire area. Snow levels will be 3000 to 4000 feet. The precipitation will turn to showers Monday night and end by Tuesday morning. Late Tuesday through next weekend we will be under a weather pattern like the one shown on the map below. High pressure will be off the coast with a low pressure area over the Great Basin. Northern California will be mostly sunny with a few clouds at times over the areas north and east of the valley. Periods of gusty north winds are expected. A weak high pressure is along the coast today. We will see partly to mostly sunny skies with mild temperatures and light winds. Late Thursday and Friday a weak frontal system will bring light rain or showers to Northern California with snow levels 5000 to 6000 feet. There will be brief break between systems late Friday and Saturday. Sunday a colder low pressure area will move into the area (see map below). Sunday and early Monday the north state will see periods of rain. The snow level will start out high but will drop to 3500 to 4000 feet by Sunday night and Monday. Another cold storm will bring snow showers to the mountains Tuesday and Wednesday. The storm that brought rain to the area has now moved east. Today we will see partly cloudy to partly sunny skies with some isolated mountain showers this morning. Tuesday through Saturday we will be under a weather pattern like the one shown on the map below. The jetstream will run across the Pacific and enter the coast near the California border. This means we will have frontal systems pass across Northern California but they will be weak. 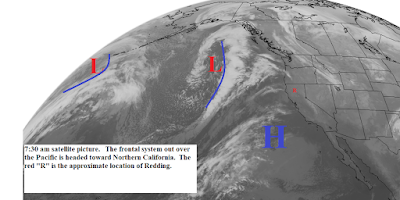 The next system will be Tuesday and will bring light rain or showers to the coast and coastal mountains, areas from Redding northward, and north of Mt Lassen over the areas east of the valley. Snow levels will be 4000 to 5000 feet. There will be a break Wednesday and then late Thursday and early Friday another weak front will bring scattered light showers to the north state with snow levels near 5000 feet. A slightly stronger storm system is due in late Saturday and Sunday and then a colder system may drops southward over the area early next week. Sorry this late. After all the years of doing this..someone at the place that hosts the blog flipped the wrong switch. This morning's satellite picture (below) shows a weak frontal system over Northern California with a stronger system off the coast. Today we see a few light showers. The stronger system moves into the area Sunday with rain. Snow levels will be start high but drop to 3500 feet north and 4500 south by Sunday afternoon. The precipitation turns to showers Monday and end during the morning. Partly cloudy Tuesday and Wednesday and then a weak system will bring light showers to the area late Wednesday and Thursday (see map below). Brief break Friday and then another weak storm on the weekend. Today and Thursday Northern California will be partly sunny with a few clouds from a storm system moving into Canada and the Pacific Northwest. Temperatures will be slightly above normal and winds will be light. Friday a weak frontal system will bring light rain or showers to our area. Snow levels will be 4000 to 5000 feet. Skies will be partly cloudy Saturday. Saturday night and Sunday a stronger frontal system will bring rain to the north state (see map below). Snow levels will start our 5000 to 6000 feet then lower to 3000 to 4000 feet in the north by Sunday afternoon. There will be a few showers Monday but they will end by noon. Tuesday through the end of next week there will be a high pressure ridge over the west. We will have mostly clear skies with night and morning valley fog. The weak frontal system that brought a few light showers to Northern California last night is now east of our area. Today we will see partly to mostly sunny skies and light winds. Tuesday afternoon and early Wednesday a very weak front wil brush the north state with few clouds and scattered light showers north of Redding. Snow levels will be 5000 to 6000 feet. Wednesday and most of Thursday will be partly to mostly sunny with slightly above normal temperatures and light wind. A weak frontal system will bring light rain to showers to the north state Friday with snow levels 4000 to 5000 feet. There will be a brief break Saturday and then a stronger storm will move into the area Sunday and Monday (see map below). Snow levels will be near 5000 feet. We will be under a weather pattern like the one shown on the map below for the next week. 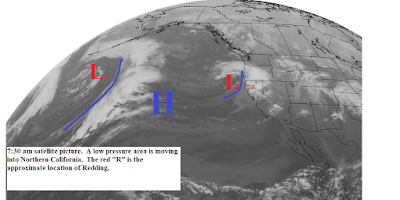 The jetstream will bring low pressure troughs and frontal systems rapidly across the Pacific and then as they reach the coast they will be pulled northeastward and weakened. This means the systems passing across Northern California will be fast moving and relatively weak. Today we will have partly cloudy to cloudy skies. The next storm will move through Sunday afternoon and early Monday with light rain or showers. Snow levels will be 4000 to 5000 feet. Monday will be a break and then a weak system will bring light rain to the coast range, the northern mountains, the valley north of Red Bluff, and the Sierra Cascade north of Plumas county. Snow levels will be 5000 to 6000 feet. Thursday afternoon and Friday a slightly stronger system will bring rain to all of the north state with snow levels near 4000 feet. The next storm will move into the area late Saturday and Sunday. The low pressure area off the coast has spread clouds and light showers over Northern California. 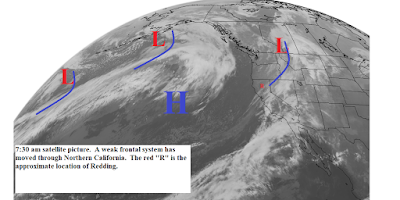 The low will move inland later today over Central and Southern California. The north state will have scattered showers through this evening with the snow level near 3000 feet. A weak high pressure ridge will keep things partly to mostly sunny Thursday and most of Friday. Saturday we will see a few clouds from a weak frontal system and there could be isolated light showers north of Redding. Sunday and Monday a stronger low pressure trough will move through (see map below). Northern California will have light rain Sunday afternoon and Monday with snow levels 3000 to 4000 feet. Skies will clear Tuesday and Wednesday and then another low pressure trough will move through Thursday and Friday. Sunny today with near normal temperatures and light winds. 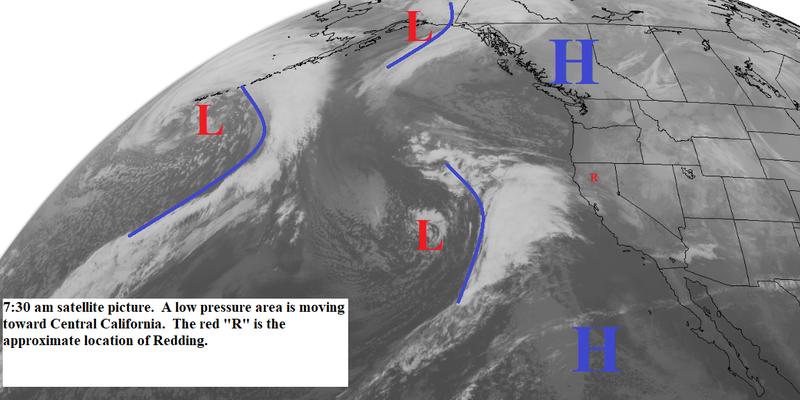 This morning's satellite picture (below) shows a low pressure area developing in the Pacific. This low will move into Central California Tuesday afternoon and Wednesday. Northern California will see scattered light precipitation from this low with snow levels 3000 to 4000 feet. Thursday through midday Saturday a high pressure ridge will be along the west coast. The north state will be mostly sunny with near normal temperatures. Clouds will increase Saturday afternoon as a low pressure trough deepens along the coast. This trough will be along the coast Sunday and Monday (see map below). Precipitation will start late Saturday and continue off and on through early Tuesday. Snow levels will be near 5000 feet.